If you liked And Then There Were None and enjoy WW II Intrigue, try this (Macneal) – Joyce's mystery and fiction book reviews with some non-fiction too! I have read and enjoyed all of the books in this series, starting with Mr. Churchill’s Secretary. Maggie Hope is a resourceful, smart and spunky protagonist who takes great, and possibly foolish, risks, in order to help with the war effort. 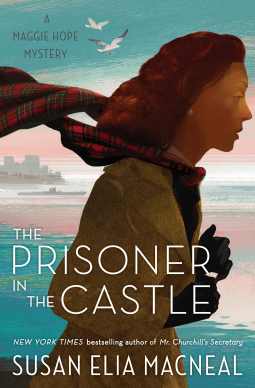 In The Prisoner in the Castle, Maggie has been exiled to an island where agents who pose a risk to security are secretly being housed. Over the course of Maggie’s stay on the isolated and claustrophobic island, life goes on with one big exception…Maggie’s fellow agents are being killed at a rapid, daily rate. Why? What danger do they present? Who can be trusted? How will the murderer be stopped? Will Maggie survive or could this be the end of the series? You will need to read the novel to find out. Thank you NetGalley and the publisher for a fun read in an enjoyable series. This series has been on my TBR for years, but I’ve never gotten around to reading it. I really should, though! You make it sound so interesting and I do love And Then There Were None. The novels in the series are fun, especially in their mix of fictional and historical personages. They are not great books but I think that they are good. I always want to read the next in the series. Last year’s book The Paris Spy was one of the best ones. Still, there is something to be said for reading them in order because of learning about Maggie’s family, etc. Let me know if you try them. I will! I’ll probably do a review of them (someday)! and i will look forward to reading it!